I have a backlog and it seems be growing faster than I can paint it. I heard Fez on the Breakthrough Assault podcast mention that he feels like he buys models more when he is painting less. I definitely know the feeling. 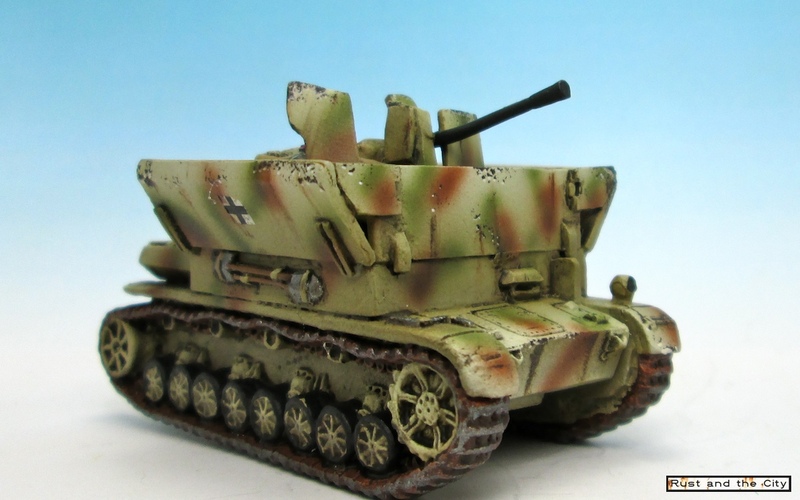 In 2015 I want to paint all of my tank and vehicle models for Flames of War. I have few enough that this should be achievable. Why did these take 6 months to finish? It's a mystery! This has been my goal for two years and I have yet to achieve it. I will endeavour to post regularly this year. I may try and post more game AARs and work in progress pictures to keep the momentum moving forward. I have plenty of different models sitting around unfinished. I feel like I could probably finish this in a few weeks if I just finished the half painted models in my collection. I'd like to finish some different Games Workshop models including a Daemon Prince and some more Then and Now posts. I'd also really like to paint an Infinity model. This model was fun. I should paint more like it. I have several unfinished models for this company before I would consider it complete (for the time being). I want to finish the last Sherman platoon, command Stuart, rifle platoon, and breaching group. Depending on how the new lists from Nachjager look I may also add a Comet platoon. Only another 20 or so models and this company could be totally complete. To do this I just need to paint another Panzergrenadier platoon and HQ along with their half-tracks. I think this is very achievable and will add a lot more flexibility to the companies I can field for Flames of War. They are lonely and need friends. This is a challenging one but will help me to complete the other goals above. Less than 20 models purchased including infantry. 6mm models count as 1/5th of a model each. In 2015 I will play 20 games of Flames of War or other miniatures games and participate in two tournaments. With two fairly local tournaments this should be achievable. Thanks for visiting. Think it can be done? Think I am crazy. Comments and wagers can be placed below! Keep up the great work buddy, your painting is an inspiration to us all! Haha. Thanks Fez. Beyond the foxholes is my favorite podcast. Buy under 20 models? Are they giant sized models? Haha. I really want to eliminate my backlog of models. 20 should be a good goal. I'll just have to avoid buying any infantry! Some well thought out and detailed goals, I reckon you can do it. Seeing a couple of armies finished off will be a great reward too. Good luck! Thanks Paul. I think they are all achievable but we will see when I get to the tally at the end of the year! It will be nice to finish some more armies. I don't think the Germans will ever be totally finished though. It it so easy to add 1 or 2 platoons and make a new company. And there are so many vehicle variants as well. Hope you attain your goals for the year! Not buying new stuff is a real tough one! Thanks Scott. Not buying models is always tough. My backlog should put me off... Unfortunately buying models seems to be the fastest and easiest part of the hobby!